Sainted Modestos, Archbishop of Jerusalem, was born into a Christian family in Cappadocian Sebasteia (Asia Minor). From his youthful years he felt a strong attraction towards strict monastic life. Saint Modestos accepted monastic tonsure. Afterwards he became head of the monastery of Saint Theodosios the Great (founded in the IV Century) in Palestine. At this time (the year 614), military forces of the Persian emperor Chosroes fell upon Syria and Palestine, killing 90 thousand Christians and laying waste the Christian churches. 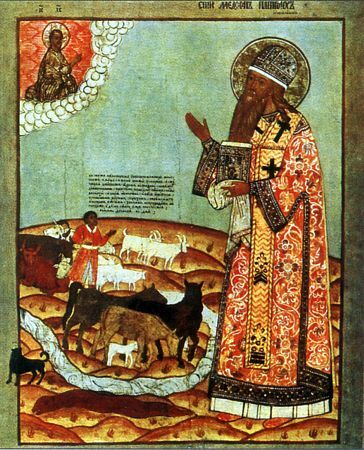 The Jerusalem Patriarch Zakharias and a multitude of Christians together with the Cross of the Lord was taken into captivity. Saint Modestos was entrusted to temporarily govern the Jerusalem Church in the capacity of locum tenens of the patriarchal cathedra. With the help of the Alexandria Patriarch John the Merciful (Comm. 12 November), Saint Modestos set about the restoring of devastated Christian holy places, among which was the Sepulchre of the Lord. He reverently gave burial to the remained of murdered monks from the monastery of Saint Sava the Sanctified. After 14 years, Patriarch Zakharias returned from captivity with the Cross of the Lord, and after his death Saint Modestos became Patriarch of Jerusalem. Saint Modestos died at age 97 in the year 634.